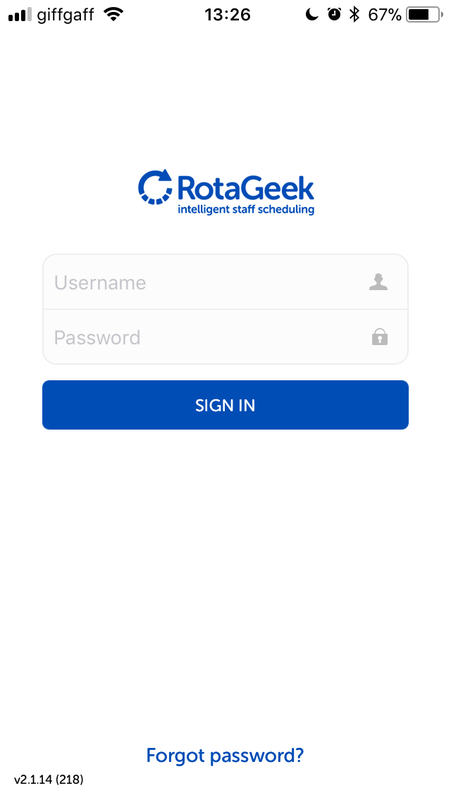 As an employee using Rotageek, you can access every feature you need via our convenient Employee Mobile App. The App is available for both Apple and Android devices and can be downloaded free from either the Apple Store or the Google Play Store. Search 'Rotageek Employees'. Log in to the App using your Rotageek username and password. If you don't know your username ask your manager in the first instance. If you've forgotten your password, click the Forgot Password button at the bottom of the screen. Once you've logged in, the Week View will open. 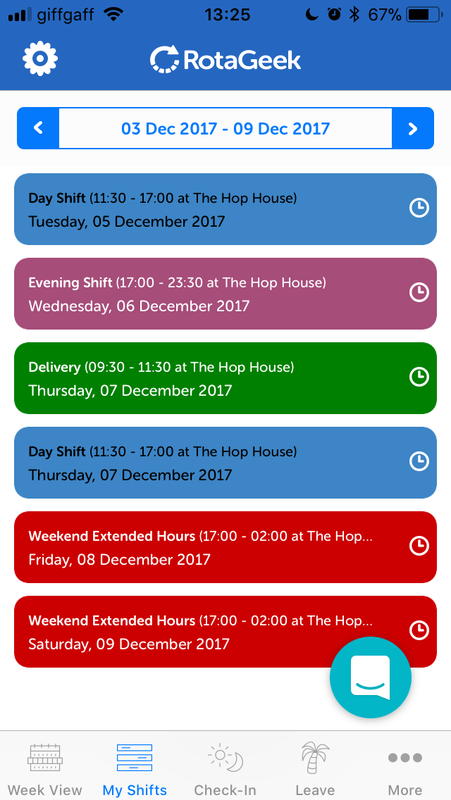 This where you can view your shifts for the week, as well as your team member's shifts. Use the date picker at the top of the screen to navigate from week to week. 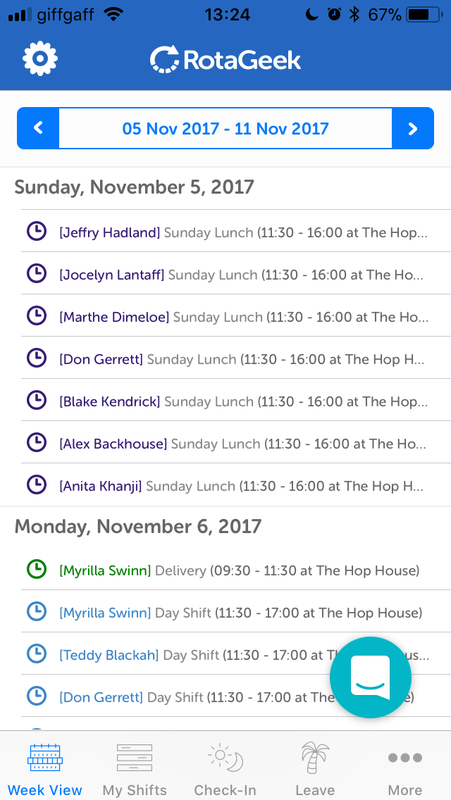 Navigate to My Shifts to view your shifts for the week. You can toggle between weeks by using the date selector. Click on a shift to view more details about it, or to request a Swap if you no longer want to work it. For a complete guide to Swaps in Rotageek including how to request them, check out our article Managing your Shift Swaps. 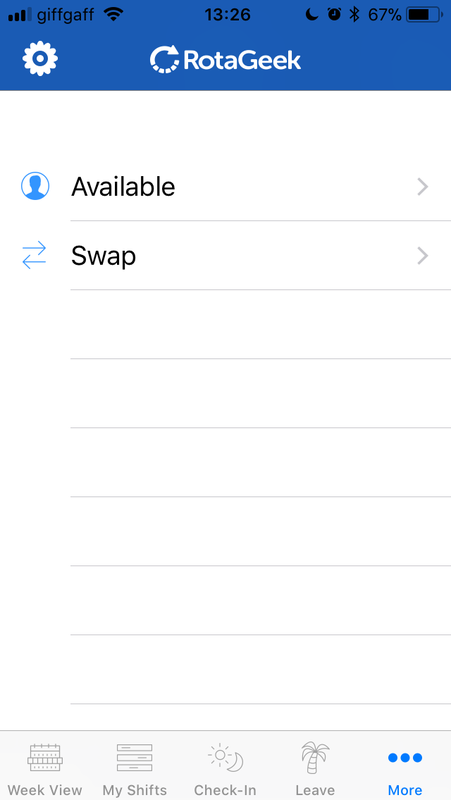 Please note that not all companies have opted to use Swaps so this feature may not be visible to some users. 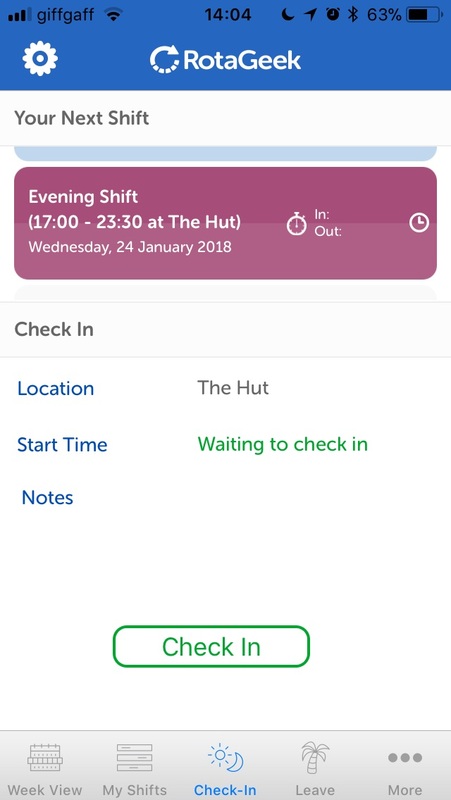 To check in and check out of your shifts select the Check-In from the menu bar. Tap check in when you start your shift, and check out when you finish. To understand more about using Time & Attendance in Rotageek please visit Checking in and out via the Mobile App. 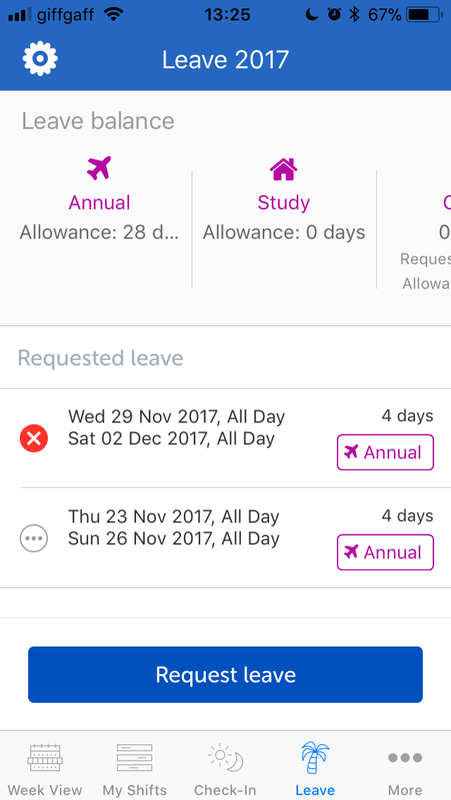 View your Leave Balance, Request Leave and see the outcome of your Leave Requests in the App. Leave requests are displayed at the bottom of the screen. The status of your Leave Request is indicated by either a red cross for rejected requests, a white circle for pending leave requests, or a green tick for requests that have been approved. To create a new Leave Request click on the Request Leave button at the bottom of the screen. This launches a new window to fill out and submit your requests. For more information on using Leave in Rotageek, check out our Requesting Leave article. The More tab allows you to view extra shifts that have become available and express your interest in working them. In this section you can also view your approved, pending or rejected Swap requests. To learn more about swapping shifts in Rotageek, visit Managing Your Shift Swaps. 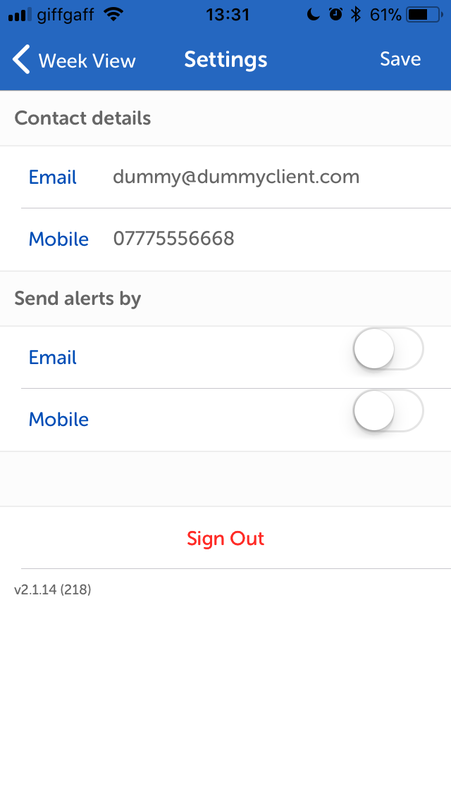 You can update your contact details in Rotageek by navigating to the Settings wheel in the top right of the App screen. In addition, update your mobile and e-mail Alerts settings. You can chat to Rotageek's support team directly through the Mobile App if you're having trouble. Click the messenger bubble in the bottom right of your screen.